The untold story of how America once created the most successful economy the world has ever seen and how we can do it again. The American economy glitters on the outside, but the reality is quite different. Job opportunities and economic growth are increasingly concentrated in a few crowded coastal enclaves. Corporations and investors are disproportionately developing technologies that benefit the wealthiest Americans in the most prosperous areas--and destroying middle class jobs elsewhere. To turn this tide, we must look to a brilliant and all-but-forgotten American success story and embark on a plan that will create the industries of the future--and the jobs that go with them. 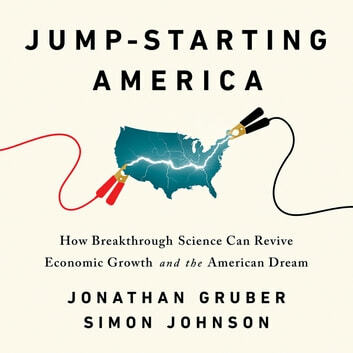 Beginning in 1940, massive public investment generated breakthroughs in science and technology that first helped win WWII and then created the most successful economy the world has ever seen. Private enterprise then built on these breakthroughs to create new industries--such as radar, jet engines, digital computers, mobile telecommunications, life-saving medicines, and the internet-- that became the catalyst for broader economic growth that generated millions of good jobs. We lifted almost all boats, not just the yachts. Jonathan Gruber and Simon Johnson tell the story of this first American growth engine and provide the blueprint for a second. It's a visionary, pragmatic, sure-to-be controversial plan that will lead to job growth and a new American economy in places now left behind.